Recycled Elastomers Market size was estimated over USD 2.5 billion in 2017 and the industry will grow by a CAGR of more than 12% up to 2025. Population growth coupled with increase in government spending has given an up thrust to the infrastructure sector in many developing nations of the Asia Pacific region, encouraging the recycled elastomers market growth in the forecast spell. India showed the fastest growth by a rate of 7.7% in the first quarter of 2018. This is due to strong performance of the construction and infrastructure sector as highway construction in India has doubled in the last four years with 27 kilometers a day in the year 2017. With more expressway and highway projects sanctioned in Asian countries, the product usage as an asphalt binder will result in recycled elastomer market growth in near future. Structural reforms taken by government to boost agricultural productivity results in rise in income of the farmers. This will substantially bolster the recycled rubber demand as it is used for protecting crops and cattle from adverse weather conditions. Extensive usage of recycled elastomers for the production of fuel rather than recycling will act as a key restraining factor for the entire industry. In the U.S, almost 300 million tires are scrapped on an annual basis and from these around 52% of the tires are used for making tire-derived fuel, used in various manufacturing industries. Scrap tires are potential sources of energy in the U.S. as it produces close to 1,065.6 trillion kilo joules of energy per year based on the discard rate of used tires and this is quite equivalent to 17 million barrels of crude oil. This is all due to their properties to produce less CO2 as compared to other fuels such as petroleum coke and coal. This will discourage the recycling activities and act as a restraining factor for the recycled elastomers market in the near future. Based on revenue, chloroprene rubber registered about 10% of the global recycled elastomers market in 2017. Product properties such as resistance to sunlight and harmful gases make them ideal to be used in the infrastructure industry for the flooring mats, bathroom accessories and as binders for asphalt used in road construction. Nitrile rubber segment was valued over USD 650 million in 2017 and will rise healthily by 2025.The product is widely used in playgrounds as it is a good alternative to grass, dirt and other surfaces. The product helps to increase the playtime along with durability and safety and reduces maintenance cost of the playgrounds. Recycled elastomers have applications in various industries among which agricultural sector accounts for almost 10% of the global market share. Superior features of products such as cost effectiveness, UV resistance, and durability makes them ideal for the agricultural sector as vegetation protectors, windbreakers, sheds, livestock mats, bumpers, feeders, etc. These help to increase the yield and efficiency in the agricultural sector. Agrarian economies of Asia Pacific region include India, China, Southeast Asian countries such as Indonesia, Thailand, etc. Agriculture is one of the major contributors in their GDP as surge in the regional population puts pressure to increase agricultural productivity. This will propel the product demand in agriculture sector and significantly boost the recycled rubber market growth by 2025. Recycled elastomers market is led by Asia Pacific region accounting for more than 50% of the global volume in 2017. The product demand is determined in the region by the presence of various application industries such as medical, agriculture, sports product, infrastructure, home & gardens etc. Large number of international and regional sports events are being hosted by the developing economies of region. 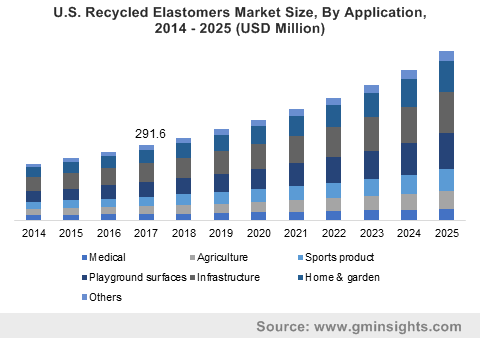 Extensive product usage in making athletics surfaces and horse arenas will subsequently act as a driver for the recycled elastomers market growth in near future. On the basis of revenue, Europe will likely witness a decent CAGR of more than 10% from year 2018 to 2025 due to increasing indulgence of the regional population in home decoration and gardening activities, driven by the high and posh standard of living has subsequently increased in the region. The highest growth will be witnessed by U.K. in the region complemented with the presence of several application industries such as medical, sports product, agriculture, etc. 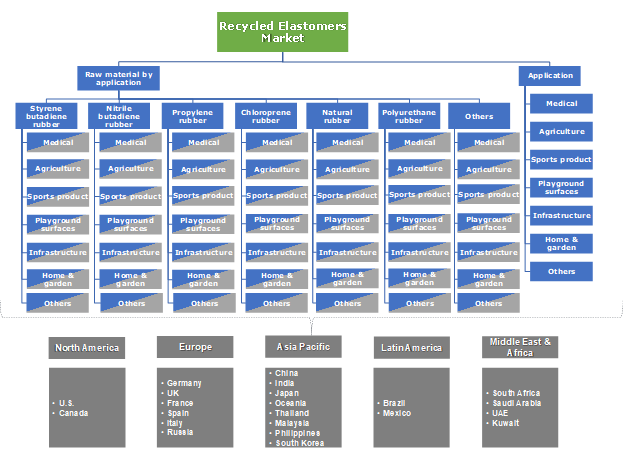 Some of the prominent players in the global recycled elastomers market are GRP Ltd., Liberty Tire Recycling, American Tire Recycling, West Coast Rubber Recycling, Monmouth Rubber & Plastics Corp., J. Allcock & Sons Limited, RubberForm Recycled Products LLC, American Recycling Center, Green Rubber One Sdn. Bsd., Austin Rubber Company LLC, Klean Industries, Genan Holding, Rubbergreen, Entech Inc., Emanuel Tire Co, Tire Disposal & Recycling Inc., Global Tire Recycling Inc. Many of these companies are implementing organic growth strategies such as plant capacity expansion and new product launch to gain competitive advantage and capture the growth opportunities available in market. For instance, in November 2016, Genan Holdings has launched a new product known as Genan safe rubber pellets. The product is employed as playground base layers and have superior performance and less bulk density. Recycled elastomers are primarily used in infrastructure industry as an asphalt binder in order to increase the durability of roads and also reduce the traffic noise. Mostly asphalt binders are made up of recycled rubber as it improves the rutting, provide the skid resistance property and reduces the hydroplaning. Besides this, the product also has application in medical, agriculture, sports product, playground surfaces, home & gardens, etc. Reduction in landfill areas across the globe possess environmental threat due to non-biodegradable nature of tires and other rubber products. This will subsequently increase the recycling activities which in turn contribute in growth of recycled elastomers market.